CINCINNATI -- The FBI is offering a $3,000 reward for information leading to the arrest of the person responsible for a suspected hate crime in Sayler Park. 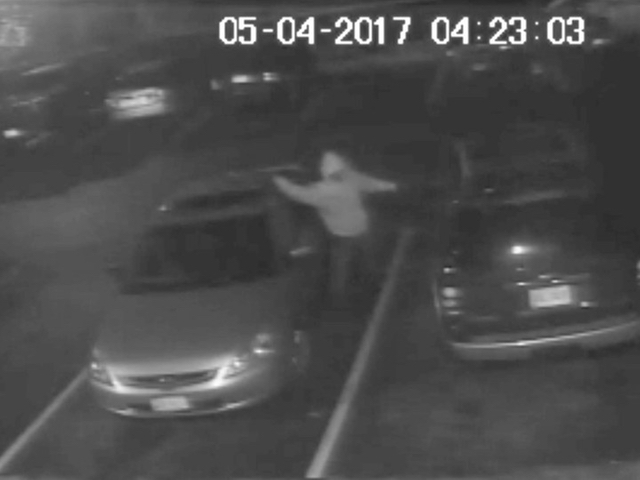 Somebody damaged and vandalized a Ford Explorer owned by a person of Middle Eastern descent at about 4:20 a.m. on May 4, 2017, Cincinnati FBI officials announced Friday. The person broke windows, slashed tires and spray painted swastikas and "Go Home," "Musslim [sic] Terrorist" and "Trump America." "We believe that this vehicle was specifically targeted because it was owned by a person of Middle Eastern descent," Special Agent in Charge Angela Byers said. The SUV was parked in a lot off Gracely Drive at the time. Byers said the owner reported it that day, and authorities were taking the incident public now in an effort to generate leads to solve the case. "Because of their wide-ranging impact, investigating hate crime is a priority for the FBI," Byers said. "And they will not be tolerated." A surveillance video recorded the person authorities believe is responsible. They were wearing a light-colored hooded sweatshirt and dark pants and appeared to be right-handed. Executive Assistant Police Chief Dave Bailey said hate crimes are rare in Cincinnati, but they can cause fear for victims and have "ripple effects" in the community. "Hate crimes are not only an attack on the victim," Byers said. "They're meant to threaten and intimidate an entire community." Paul Booth of the Cincinnati Human Relations Commission listened to authorities discussing the incident. He called it "totally appalling." "This is no place for hate," Booth said. "We've got to lock arms. We've got to stand together as a community, and when we see something we must say something." Authorities asked anyone with information to call the FBI at 513-979-8333 or visit tips.fbi.gov. The Cincinnati chapter of the Council on American-Islamic relations announced Friday that they were also offering a $1,000 reward for information. CAIR-Cincinnati Executive Director Karen Dabdoub urged anyone with information to contact authorities. "We thank the FBI for its action in this case and hope it sends a strong message that acts of anti-Muslim bigotry will be prosecuted to the full extent of the law," Dabdoub said in a news release. Sayler Park residents also held a candlelight vigil to promote peace, tolerance and understanding on Friday night, all of them firmly saying that hatred is not what their community stands for.